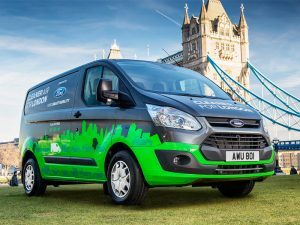 New Ford plug-in hybrid vans are to be trialled by London businesses from this autumn as part of a £4.7m project. Ford is to provide 20 Transit Custom PHEVs for a 12-month trial period. Ford will provide 20 Transit Custom PHEVs to a number of commercial vehicle fleets across the Capital for the 12-month trial, forming part of its plans to launch 13 electric vehicles over the next five years. Ford’s Dunton technical centre has developed the vehicle alongside Prodrive Advanced Technology’s facility in Banbury. The project is being part funded by the Advanced Propulsion Centre (APC) and is being run in partnership with Transport for London – which will deploy a number of the vans for its own fleet. A cross-section of city-based businesses will take part in the trial, operating the vehicles in everyday use and using Ford telematics technology to collect data on the vehicles’ financial, operational and environmental performance. Ford’s plans to launch new global electric vehicles also include a fully electric SUV with an estimated range of at least 300 miles, a high-volume autonomous hybrid vehicle designed for commercial ride hailing or ride sharing to debut in North America in 2021, and a hybrid version of the Mustang sports car. Ford has also signed memorandum of understanding with several other automakers to create the highest-powered charging network for electric vehicles in Europe.